The global Slewing Bearings market is estimated to surpass $4,105.9 million by 2024, growing at CAGR 3.03% during the forecast period 2018-2024, majorly driven by the increasing focus on renewable energy and growing infrastructure sector. Urbanization in emerging economies has also led to an increase in commercial and office construction market which is driving the global slewing bearings market. Slewing bearing is a rotational bearing component which is usually used in machines that require heavy and bulk handling. These bearings help in developing to and fro movements as well as rotational movements. They are used for simple applications such as to facilitate the movement of winches to complex applications such as in drilling and excavator machines and offshore machines. They work based on the axial and radical forces which results in tilting moments. Slewing bearing has many advantageous over traditional bearings such as the ability to support both horizontal and vertical arrangements. The market for slewing bearings is huge in APAC, particularly in countries such as Japan, South Korea and China where it is being used extensively. The market for slewing bearings in China has been increasing rapidly due to the numerous solar investments made by the government as well as the growing medical sector. This report incorporates an in-depth assessment of slewing bearings market by gear type, rolling element, construction/design, application and geography. The major gear types of slewing bearings encompassed in the scope include ungeared, external and internal gear. What are the major applications of Slewing Bearings? Slewing Bearings is mostly used for various applications such as wind & solar energy, robotic equipment, medical equipment, packaging, mining, marine vessels, material handling equipment, water treatment, military, communication equipment and others. These slewing bearings are present in almost all the industries where the process demands the control and handling of materials and goods. The other applications where slewing bearings are used include offshore crane and drilling equipment in oil & gas, amusement park rides and steering gears. The growth in infrastructure and construction industries is expected to drive the market of slewing bearings. Currently, slewing bearings are witnessing a significant demand due to its increasing applications in the infrastructure industry and renewable energy. The global cumulative installed wind power capacity has increased from 371,317 megawatts in 2014 to 539.291 megawatts in 2017 and the trend is expected to continue in the near future due to the significant investments made by various governments in this sector. Slewing bearings are one of the main components of a wind mill turbine and hence the market for slewing bearings is also expected to grow in the near future. 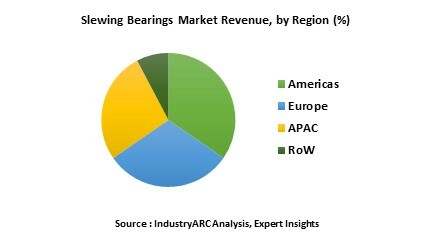 Who are the Major Players in the Slewing Bearings Market? The report incorporates in depth assessment of the competitive landscape, product market sizing, product benchmarking, market trends, product developments, financial analysis, strategic analysis and so on, to gauge the impact forces and potential opportunities of the market. Apart from this, the report also includes a study of major developments in the market such as product launches, agreements, acquisitions, collaborations, mergers and so on, to comprehend the prevailing market dynamics at present and its impact during the forecast period 2018-2024. All our reports are customizable to as per the company needs, to a certain extent; we do provide 20 free consulting hours along with the purchase of each report, this which will allow you to request any additional data to customize the report to as per your needs.